Cell line development has various applications in recombinant protein and antibody production, drug screening, and gene functional studies using stable cell lines. The process of developing stable cell lines involves transfecting selected host cells with desired plasmids; screening and quantification of high-expressing clones; and validation of the proteins. Reduced production costs of biopharmaceutical proteins as an outcome of development of recombinant cell lines that produce high levels of expressed protein products are influencing the growth of the cell line development market. The cell line development market is segmented by source, type, application, and geography. This report provides an exhaustive value chain analysis for the year 2017, and forecast up to 2024. In 2017, the cell line development market was valued at $3269.1m. The market value is further estimated to reach $7274.7m by 2024, growing at a CAGR of 12.2% during the forecast period 2018–2024. North America generated 39% of the cell line development market revenue in 2017. The APAC market is expected to grow at a CAGR of 13.8% during the forecast period. The primary objective of cell line development is to develop new clones that has important applications in drug screening and gene functional studies. The various analysis performed in this market include microbiology analysis and protein analysis. Newer technologies that are being used such as automated screening methods, cell line engineering, enhanced expression systems, improved process monitoring, and use of disposable apparatus are key factors that are contributing to the growth of the cell line development market. The market is consolidated with a few number of global players. The high capital and maintenance requirements associated with the protein of vectors, expression systems, and cell cultivation are restricting the entry of new players into the market. Recombinant cell lines are used to reduce the production costs of bio pharmaceutical proteins. One of the biggest challenges that the cell line development market faces is high capital costs. As the R&D of new drugs is capital expensive, only the major companies can afford to produce new drugs. The drugs derived from monoclonal antibodies (mAbs) for the treatment of diseases such as leukemia and lymphoma are expensive. These factors are hindering the growth of the cell line development market. Complexities in the development of stable cell lines and high risk of contamination, which leads to wastage of time and funds, are also hindering the market growth. The base year of the study is 2017, with forecast done up to 2024. The study presents a thorough analysis of the competitive landscape, taking into account the market shares of the leading companies. It also provides information on unit shipments. These provide the key market participants with the necessary business intelligence and help them understand the future of the cell line development market. The assessment includes the forecast, an overview of the competitive structure, the market shares of the competitors, as well as the market trends, market demands, market drivers, market challenges, and product analysis. The market drivers and restraints have been assessed to fathom their impact over the forecast period. This report further identifies the key opportunities for growth while also detailing the key challenges and possible threats. In 2018, Denali Therapeutics entered into a partnership with Lonza to develop and produce biologic medicines using the latter’s cell line development technology GS Xceed. In 2017, CBMG entered into a partnership with GE Healthcare for the manufacture of stem cells used in cell line development. 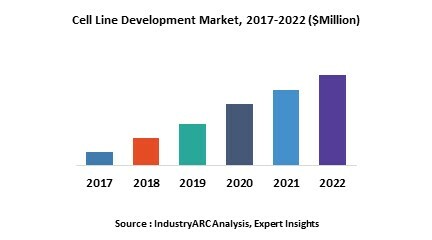 The cell line development market is emerging in the developing countries due to the increased awareness about cheaper medicine manufacturing and protein generation. The growth in this market is driven by increase in the demand for vaccinations and gene therapies in emerging economies. 14.10. Thermo Fisher Scientific, Inc.
14.11. Wuxi Apptec and More. "*Financials of private companies would be provided on a best-efforts basis"